The Midland Theatre was built on a corner near the civic precinct of Ararat for Otto Spehr and J. Friedman. Designed by architect Rhys Hopkins to hold nearly 1000 patrons, it opened in 1938 as one of the largest purpose-built commercial cinemas in rural Victoria. The building was renamed the Astor in 1959. The theatre is a large brick parapeted building designed in the Moderne style of the 1930s. It curves around the corner site with cream brick used for the Barkly Street elevation and the curved section, and contrasting red brick for the Queen Street elevation and the rear elevations. Vertical and horizontal elements are balanced within the composition. The curved corner is strongly detailed with a recessed quadrant section featuring vertical cream brick fins and vertical strips of windows with contrasting horizontal transoms. A rendered strip trims the top of the parapet and rendered cornices are used to divide the facades into a ground floor, a taller first floor and a deep parapet. A cantilevered awning repeats the curve of the building. 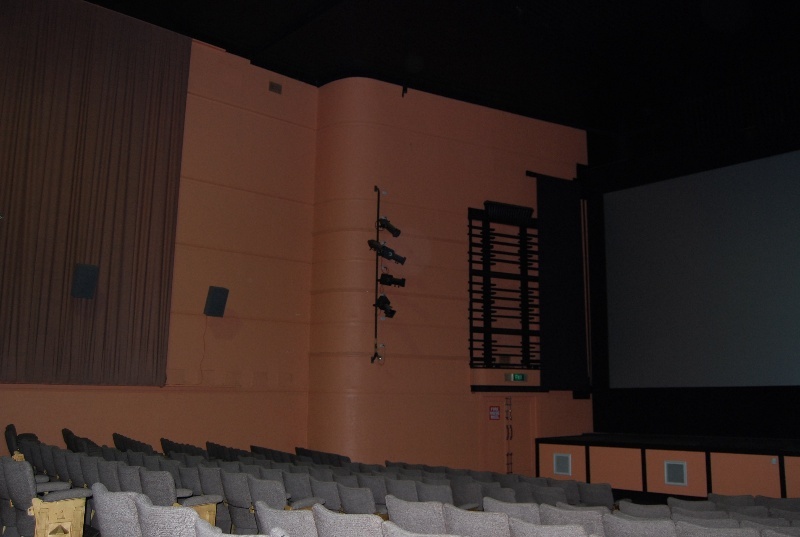 Decoration throughout the interior of the theatre is minimal, in keeping with the Moderne style. 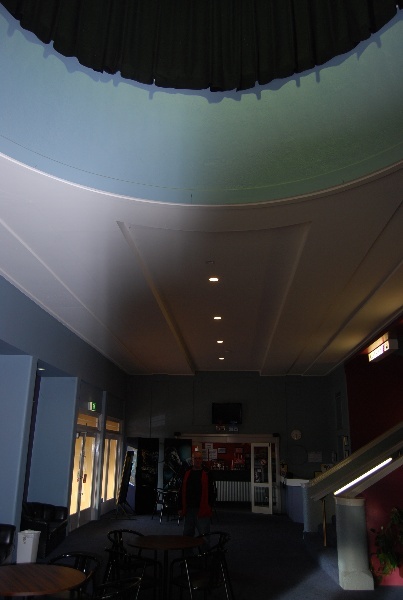 The corner curve of the building contains a circular opening at first floor level which originally linked the upper foyer to the foyer below. A wide central staircase provided access to the upper foyer. The auditorium is designed using a stadium form of seating, with no public space provided below the dress circle. Few live performances were held in this theatre despite the provision of a stage in the auditorium. The theatre ceased operation after the advent of television. However it reopened in the 1980s when two small theatres were installed at the rear of the main auditorium, largely replacing the dress circle and upper foyer. The Midland Theatre, Ararat is of architectural and historical significance to the State of Victoria. 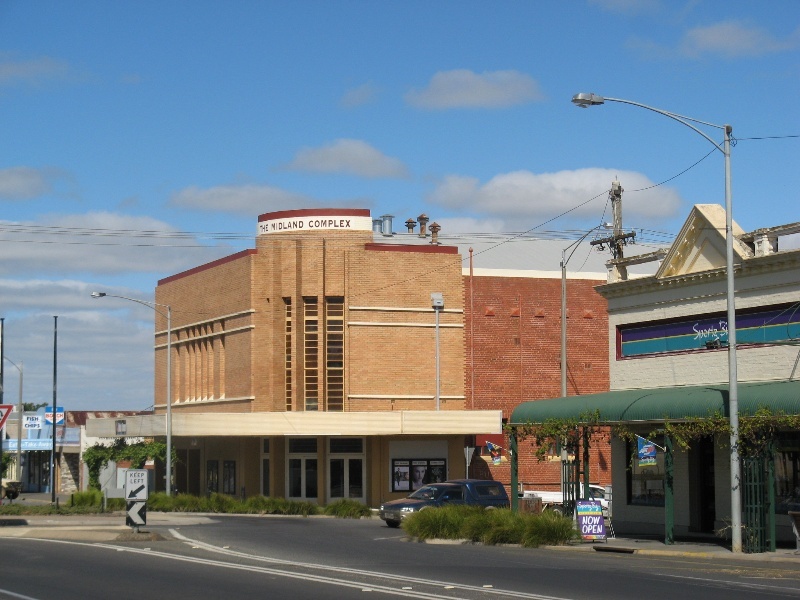 The Midland/Astor Theatre, Ararat is of historical significance as one of the largest purpose-built cinemas in rural Victoria. It is important for its association with a major form of popular entertainment in the twentieth century and its reflection of the popularity of this form of entertainment in country Victoria from the late 1930s to the 1950s. The Midland Theatre, Ararat is of architectural significance as an important, and relatively intact, example of the Moderne style in Victoria, in particular the work of the architect Rhys Hopkins who was described as one of the most important and innovative Moderne architects in Melbourne. It is unusual for the stadium seating form adopted in the auditorium and for the circular opening which originally linked the foyer levels. 1. All of the building marked B1 on Diagram 2228 held by the Executive Director. 2. 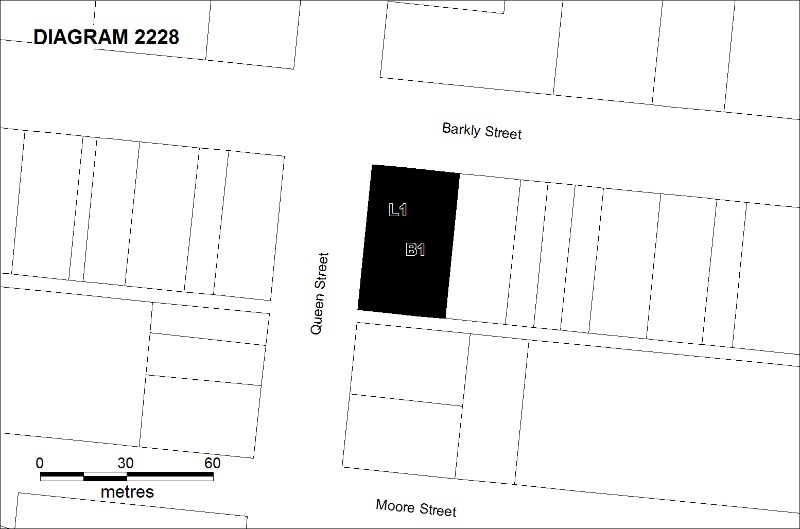 All of the land marked L1 on Diagram 2228 held by the Executive Director being all of the land described in Certificates of Title Volume 10433 Folios 963, 964 and 965. Ozone Theatres, a partnership of six brothers called Waterman based in Adelaide, leased the cinema briefly in 1940. 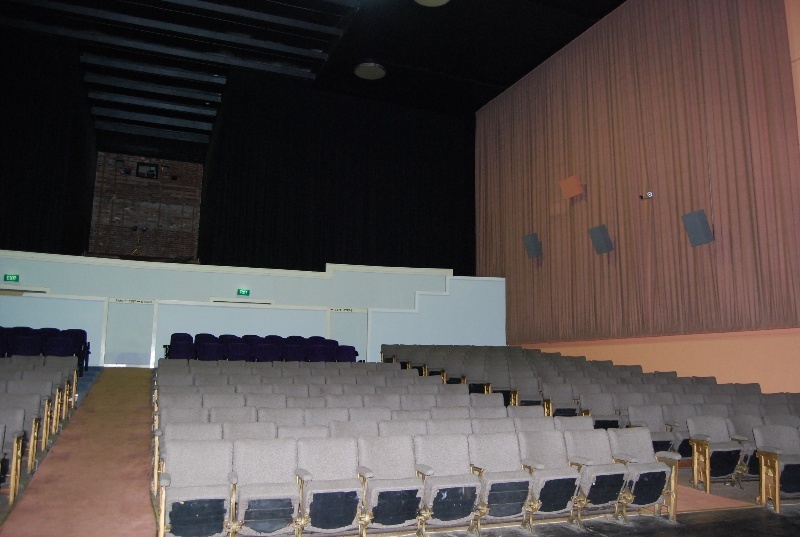 Their most important cinema was the remarkable Ozone Cinema in Mildura, since demolished. Otto Spehr was the recorded as the exhibitor from 1943-44 until 1958. In 1954 he became notorious when he declared he would not play the National Anthem anymore unless he received an apology from the King or the Governor General for a ten shilling traffic fine which he considered unjust and for what he claimed was rude treatment by Melbourne police. Following a very large public meeting, a boycott was imposed and Spehr eventually abandoned his resolve. (Sun, 4th March 1950; Sydney Morning Herald, 31st October 1950; Herald, 31st October 1950; Herald, 4th November 1950) The Midland was originally licensed to seat 934 persons but this was increased to 966 by the mid 1950s. (Film Weekly Motion Picture Directory, various years) The Paramount had accommodated about 525 and the Town Hall about 700. While large the stage was not used for live performances. Spehr did apply for a full theatre licence but was rejected by the Health Department because of the lack of back stage facilities. (Kennedy, 1998, op. cit.) 'In December 1958 Spehr advised the Health Department that Messrs G. Stazio of Hamilton and D Steward of Ararat had taken over the business and shortly afterwards, in February 1959, Kirby Theatres Pty Ltd (of Sunshine, Melbourne) advised the Health Department that they were running the business trading as Ararat Pictures Pty Ltd.' (Kennedy, 1998, op. cit.). The architect for the Midland Cinema was Rhys Evan Hopkins (1910-1996). (Robin Grow, 'A Quiet Revolutionary', Spirit of Progress, Vol. 8, No. 1, 2007, pp. 14-17) Hopkins was considered one of the more important Modernists in Melbourne. In his seminal history Victorian Modern, Robin Boyd used an illustration of a small house Hopkins had designed c.1933 as 'the first shot' in the Modernist revolution. (Neil Clerehan, 'Obituary', The Age, 16 April 1996) He was the architect for the Williams the Shoeman chain of shops throughout Victoria but was best known for his domestic work, particularly the house Carlaminda, Toorak (1938). Hopkins had already designed the Plaza Theatre, High Street, Northcote (1934) actually the reworking of the Northcote Market. It survives but is now much compromised. The Midland Theatre is illustrative of one of the most popular forms of entertainment in the twentieth century, the cinema, particularly from the late 1930s to the 1950s. The Midland Theatre is a fine example of the Moderne style in Victoria, in particular the work of innovative Victorian architect Rhys Hopkins. 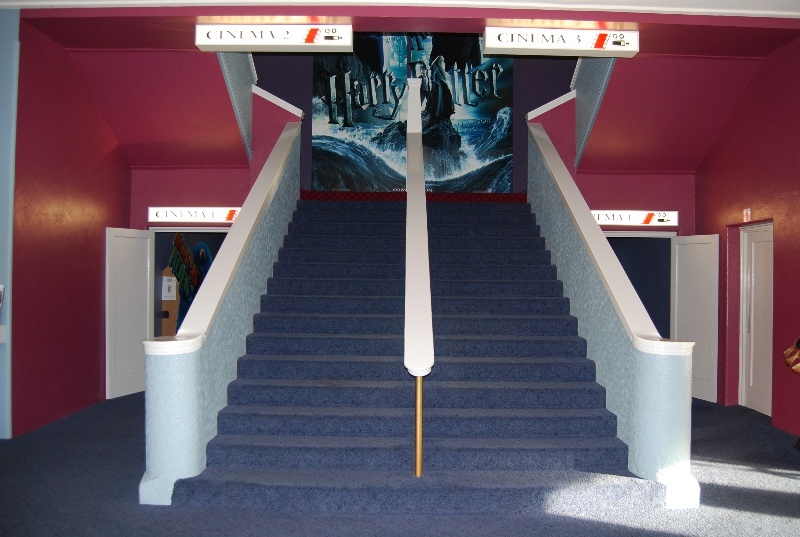 It is one of the largest purpose-built cinemas in rural Victoria, incorporates an unusual two level foyer opening and adopts a rare stadium form. This cinema was designed by the innovative architect, Rhys Hopkins in the Moderne style. On opening in 1938, it was one of the largest purpose-built commercial cinemas in rural Victoria. General Conditions: 1. All exempted alterations are to be planned and carried out in a manner which prevents damage to the fabric of the registered place or object. General Conditions: 2. Should it become apparent during further inspection or the carrying out of works that original or previously hidden or inaccessible details of the place or object are revealed which relate to the significance of the place or object, then the exemption covering such works shall cease and Heritage Victoria shall be notified as soon as possible. Note: All archaeological places have the potential to contain significant sub-surface artefacts and other remains. In most cases it will be necessary to obtain approval from the Executive Director, Heritage Victoria before the undertaking any works that have a significant sub-surface component. General Conditions: 3. If there is a conservation policy and plan endorsed by the Executive Director, all works shall be in accordance with it. Note: The existence of a Conservation Management Plan or a Heritage Action Plan endorsed by the Executive Director, Heritage Victoria provides guidance for the management of the heritage values associated with the site. It may not be necessary to obtain a heritage permit for certain works specified in the management plan. General Conditions: 4. Nothing in this determination prevents the Executive Director from amending or rescinding all or any of the permit exemptions. General Conditions: 5. Nothing in this determination exempts owners or their agents from the responsibility to seek relevant planning or building permits from the responsible authorities where applicable. Minor Works : Note: Any Minor Works that in the opinion of the Executive Director will not adversely affect the heritage significance of the place may be exempt from the permit requirements of the Heritage Act. A person proposing to undertake minor works may submit a proposal to the Executive Director. If the Executive Director is satisfied that the proposed works will not adversely affect the heritage values of the site, the applicant may be exempted from the requirement to obtain a heritage permit. If an applicant is uncertain whether a heritage permit is required, it is recommended that the permits co-ordinator be contacted. Installation, removal or replacement of projection and sound equipment (excluding early or significant equipment), providing they do not adversely impact on significant elements, or involve structural alterations. Painting of previously painted walls and ceilings in appropriate heritage colour schemes, provided that preparation or painting does not remove evidence of any original paint or other decorative scheme. Installation, removal or replacement of screens or curtains, including cinema screens and curtains (and associated structure), curtain tracks, rods and blinds, other than where structural alterations are required. Installation, removal or replacement of hooks, nails and other devices for the hanging of mirrors, paintings and other wall mounted art works. Installation of plant within the roof space, providing that it does not impact on the external appearance of the building or involve structural changes. Installation, removal or replacement of fixed seating, other than early or original seating. Any interior works to these later theatrettes. 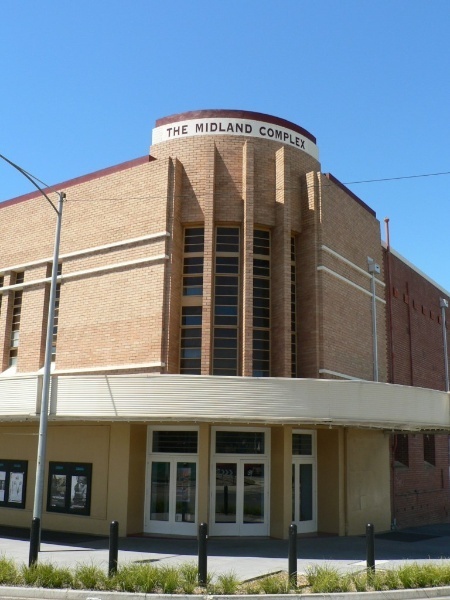 The significance of the Midland Theatre, Ararat is primarily due to the innovative and distinctive Moderne architectural style adopted in its design. 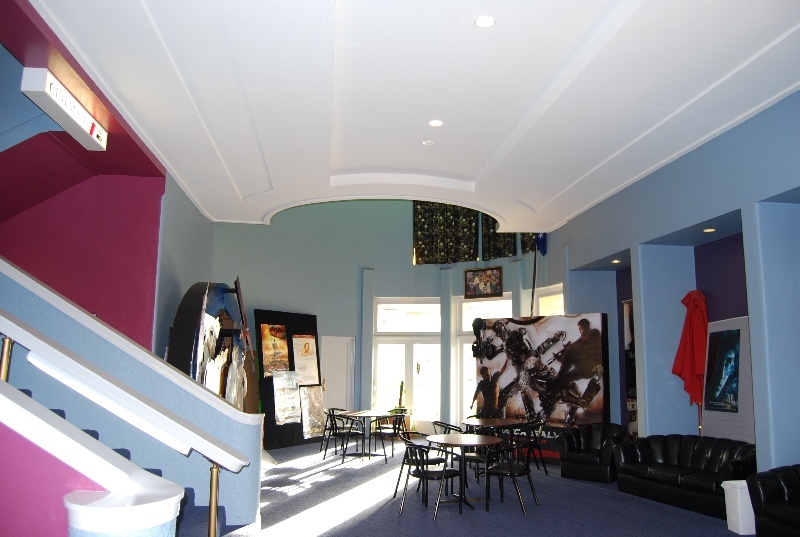 It is also important as one of the largest purpose-built rural cinemas in Victoria and for its associations with the major form of mass entertainment in the twentieth century. Important elements include the two main facades and interior features including the unusual auditorium stadium seating, the remaining cast iron seats, the two level foyer opening and the foyer staircase. The alteration or removal of any of these elements would require a permit. Modifications to the building include the insertion of two small theatres to the rear of the auditorium, largely replacing the dress circle and upper foyer. This has resulted in the construction of new walls at the upper level, including a new wall isolating the original circular opening from the public area. The purpose of the permit exemptions is to allow works that do not impact on the significance of the place to occur without the need for a permit.